NEW! Quick and Easy Disk Cloning — creates a complete clone of a system hard disk, including the operating system, applications, settings, and all user data. NEW! Complete Disk Imaging — creates and restores complete disk image file backups that can be stored virtually anywhere, including network attached storage devices and drives containing other data. NEW! SmartStart™ Wizards — greatly simplify the process of replacing an existing Windows system disk with a new disk to increase speed or storage capacity. ENHANCED! Solid State Drive (SSD) and Advanced Format Drive Support — automaticallly detects and optimizes data alignment on Solid State and Advanced Format drives. EXCLUSIVE! AccuClone™ Technology — exclusive disk imaging technology ensures a perfect image whether running natively from within Windows or from the Casper Tech Edition customized boot environment. EXCLUSIVE! Automatic Copy Verification™ — assures the reliability and dependability of the backup by ensuring data is not corrupted during the imaging process by faulty RAM, a defective cable, failing disk, or bad controller interface. EXCLUSIVE! Automatic Pre-Image Verification — detects problems with the source device before updating an existing backup. EXCLUSIVE! SmartWrite™ Technology — automatically optimizes disk I/O to maximize performance and minimize CPU utilization and Windows resource demands during the disk imaging process. 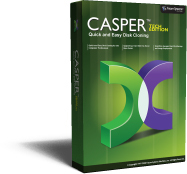 Casper's innovative SmartWrite technology ensures maximum performance and uninterrupted use of the computer when imaging a disk. EXCLUSIVE! SmartClone™ Technology — innovative differential disk imaging technology dramatically reduces the time required to update a backup, restore, or re-image a system. EXCLUSIVE! SmartResume™ Technology† — provides support for safely resuming an interrupted backup to another disk or image file. NEW! SmartRelease™ — automatically prepares a portable backup drive for safe removal after a backup has been completed. EXCLUSIVE! SmartAlert™ Notifications — notifies you via email when the disk imaging process has been completed. NEW! Advanced Power Management — automatically suspends, hibernates, or powers-off the computer at completion of the disk imaging process. ENHANCED! Runtime Controls — allows you to quickly change power management and notification options after the imaging process has been started. EXCLUSIVE! USB Boot Capability — creates a fully bootable copy of a Windows system drive that can boot and run directly from an external USB drive. NEW! Configurable Startup Disk — creates a customized startup environment for Casper Tech Edition on a USB flash drive or CD/DVD with options to add additional storage and network drivers, custom drivers, custom network settings, and more. Designed for Windows — provides complete disk imaging capabilities entirely from within the Windows environment. Since Casper Tech Edition was designed from the ground up to image disks directly for Windows, Casper never requires the original system or destination hard disk to be removed after completing a copy — the source and destination hard disks can coexist in the computer at all times. Native 64-bit Support — provides true 64-bit performance on Windows 64-bit platforms. Advanced Disk Management — provides advanced disk management functionality. Use Casper Explorer to review past activities performed with Casper Tech Edition, create and remove partitions, change the active partition, change a drive letter assignment, replace damaged or missing boot records, and more.